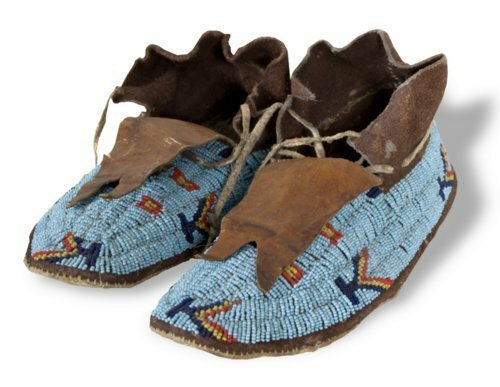 Slip-on leather moccasins decorated with beadwork on the uppers. Sinew wrap closure at ankle. Used by western artist Lawrence Coffelt as a prop in his Flint Hill Studio in Emporia, Kansas. Coffelt was born in Sycamore Springs, Kansas, in 1910, and died in Emporia in 1976. He operated outdoor advertising businesses in central Kansas for about 25 years before retiring and turning to art full-time in 1960. Coffelt was a largely self-taught artist who produced oil paintings and bronze sculptures.